On 17th December 2013, the Swanwick family lost one of our most-loved members. This is our tribute to Mary, with love. Family was Mary’s greatest love. Her children and grandchildren will forever recall her recounting tales of the adventures and achievements of their ancestors – sometimes in awe, sometimes hilariously - while always encouraging and supporting the current generations. A loved sister, sister-in-law and cousin, Mary was also a much loved aunt, relishing contact with her widely scattered nieces and nephews via lengthy transatlantic phone calls and even longer lunches together in Manchester. Stories of Mary show a woman of many and varied interests. She loved all her friends and they loved her – for, just as she was with her family, Mary was a loyal, loving and fun friend. A gifted and successful writer, generous with her encouragement, advice and tutoring, Mary brought clarity of vision and a perfect choice of words to all her interests together with a great sense of humour. Materialism held no interest for Mary. She was more interested in spending time with family and friends, at home and abroad, especially in France where she was adept at the language. Dedication to the underdog, both two-legged and four-legged, characterised her life. She loved encouraging people to achieve their dreams, whatever they were, and especially at Swanwick. For over forty years, the list of duties Mary undertook is awe-inspiring, ranging from committee member to tutor, from pantomime stalwart to handing out keys on arrival. Mary loved nature. Friends and family recall that walking to lunch could be laborious as she rescued worms from pavements and checked lame pigeons en route. On arrival, she would spot thirsty flower arrangements, often taking direct action by watering them herself. Her home was something of an animal sanctuary, with spare rooms devoted to hedgehog recovery and the garden dedicated to wild life support … and lavender. Mary loved the colour and fragrance of this herb and its healing properties. A life-long dog lover, Mary sometimes had as many as five dogs, mostly rescued. A neighbour once suggested she should take them out harnessed to a wheely bin in which Mary could stand: a twenty first century Boudicca. It is a fitting image as Mary had a great affection for Huskies. At the age of 74, she supported a new dog sledding event in the Forest of Dean. Uniquely, it included night racing and there she was, at night, in the freezing cold, encouraging dogs and mushers, as well as being a Race Marshall. Mary also loved science and was particularly drawn to astronomy: her home displayed favoured images of galaxies and stars. Alongside this, Mary explored matters of the soul. Her deep sensitivity to the divine led her to join a ‘Micro Community’ exploring the Christian message at ‘street level’. A community member’s tribute is particularly apt: 'She is a great lady: once met never forgotten. May she rest in peace and know the fullness of God's compassionate love’. Mary fully engaged with all that caught her attention: her family, friends, writing, nature, languages, science, astronomy and spirituality. Maybe she was more Renaissance woman than Boudicca. Either way, her star – this unique, one-off star - shone bright for all of us, and will continue to lighten our lives for a long time to come. At one time Mary and I were both regular users of the same taxi service. Half the drivers were absolutely devoted to her whilst the rest claimed to be terrified. ‘You never know what she’s going to come out with next’ said one of them. And another, dropping me off at the Paddock, gasped ‘You mean to tell me that you’re actually going IN?’ But he had never seen her with animals. When Mary came to my house, my own painfully shy dog would rush past me to be sure of being the first to greet her. And my favourite picture of Mary is of her striding along with Jack at her heels. No, there’s one I like even more: sitting in the twilight with her, watching the little urban foxes eat the dog-meat dinner that this committed vegetarian had prepared for them. The animals understood Mary much better than some of the taxi drivers. They will miss her. And I will miss her humour and her kindness and her candour. It’s hard to say goodbye to a friend you’ve known and loved for so long. How long? Sometime in the early 70s I recall meeting Mary for the first time at Swanwick and being enchanted by her humour and vitality. We were both embryo writers, young housewives with young children. We sat together one night on a bench in the grounds and watched the well-heeled seriously successful lady authors drifting by as they headed towards the conference hall, dripping in jewels and laughing. We sat, awe-struck as they entered the hall. Mary took a deep breath. A woman of determination, you made it alright Mary, and in spades. Along the way you fired so many other would-be writers with your own enthusiasm and fierce determination and always your love of humanity. Those of us who knew and loved you well will forever see you, fag in hand, holding court on the lawn as you entertain us still with your tales. God love you, Mary, for we all do. Mary had a true linguist's ear and spoke very good French. But she never had much patience for extensive background reading, so her early books drew on locations she knew well from childhood and adolescence – Derbyshire, North-west Scotland and the south of France. As she extended the range of her novels, Mary encountered the problems of foreign detail. Once, having set a novel in Brazil she was asked about her research sources and indignantly pointed out that she had read an article on the Amazon in National Geographic magazine. Another novel was set in Finland but as Mary knew no Finnish apart from the word 'sauna', she asked me for help. As it happened, one of my students at the time had a Finnish wife who supplied various terms of endearment which Mary duly incorporated into her novel. For months afterwards she had letters complimenting her on her excellent knowledge of Finnish. Like all good linguists, Mary was also a superb mimic and could do a number of regional accents. Her Glasgow imitations, male and female, were impeccable and one of her many Scottish friends begged her to stop because she fell for it every time. Even I had to admit that the only way I could tell it was Mary was because I was so familiar with her voice. During the infamous ‘Winter of Discontent’ - when the country was reduced to a 3-day week and power cuts took place without warning - Mary was struggling to get her eighth Mills and Boon submission ready to send. Having had seven full length novels rejected, she worked on, convinced she would break through, a pen torch at hand to put between her teeth if the house was suddenly plunged into darkness. There can be no better role model for new writers. I find it almost impossible to squeeze 32 years of close friendship into a few short lines. From the first time Mary and I met at Swanwick, we clicked and became firm friends. She was a warm and giving person and has left me so many happy memories for which I shall be eternally grateful. She gave unreservedly of herself to her beloved Swanwick for over 40 years. Now there is a void which can never be filled. Mary contributed to Swanwick with courses, talks and workshops, acted in the pantomimes, did adjudications, made sure the bar was fully supported and the birds and the wildlife fed, sold raffle tickets, collected for our charities, judged competitions, distributed room keys, helped in the book shop and served several times on the committee. In fact there weren't many Swanwick jobs that Mary didn't willingly have a go at. One of the jewels in the Swanwick crown is missing and can never be replaced. It now shines twice as bright. Mary love - I miss you terribly but you will always be with me in my memories and my soul. Thank you for having been my very, very dear friend. I knew Mary because she and my wife, Eileen, were best friends. They first met in the early 1970s when they became members of 'The Scribblers Club' in Manchester. Mary, married with a daughter, was writing hard and already displaying the stubborn determination to succeed that would take her to the top of the Romantic Novelist's Tree - Mills & Boon. The two pals met and wrote, then met and wrote some more, until they found Swanwick which, for the next 40 years, became what can only be described as a home from home. Mary was single minded and she persevered, refusing to rewrite but learning her trade until in 1973 she wrote her ninth book, 'Black Niall', and she was off! 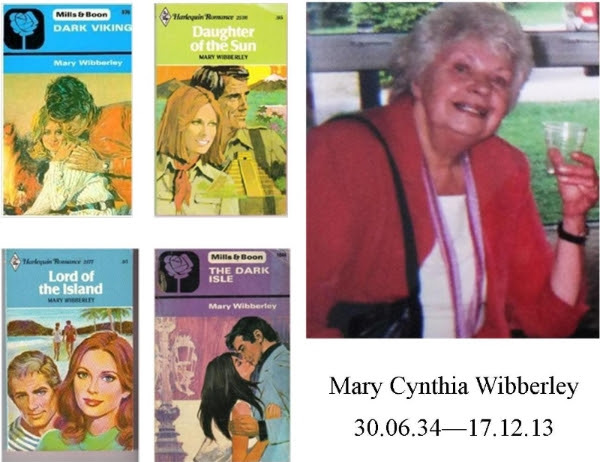 Over the next ten years, Mills & Boon published 39 of her novels (84+ if you count the foreign editions) and she became a popular speaker and tutor, modest in her claims when it came to giving advice but truthful and constructive whenever she was asked to give it. Apart from her mountain of fiction, Mary also wrote, 'To Writers with Love: On Writing Romantic Novels'. Typically generous, it broke new ground at a time when practical advice and fellow encouragement was hard to come by in that particular genre. Quite apart from being a successful author, Mary was also a loving wife and mother, as protective of her privacy as she was of her good works. Not a woman to suffer fools gladly she nevertheless gave everyone the benefit of the doubt and could be generous to a fault - although she would deny that she had any! At a moment like this it is difficult not to be saddened by the death of someone who made such a difference to the lives of so many. I remember her during the daily rush and tumble of Swanwick life as being an independent spirit who took part in everything that interested her but provided an alternative point of interest for a small group of like minded members who occupied a spot on the lawn that became known as - theirs! In her private life Mary was a constant friend and a generous one with a wicked sense of humour that could tickle the ribs or blow you out of the water, depending on the time and the place. Swanwick will be the poorer for having lost her and we are grateful that she found us and took us to her heart as happily as we took her to ours. To find oneself in the middle of the Forest of Dean on a cold February day with only Mary for company is a daunting prospect to say the least. We were paired as marshals on the Wye Dean Quest dog sled event. I had first met her at Swanwick the August before and it was clear that she was a formidable, forceful and daunting character. My prospects for the next three hours looked bleak. I needn’t have worried. Mary was witty, empathetic and knowledgeable and we chatted endlessly on just about everything under the sun. She also displayed considerable tact when an idiotic member of the public, unconnected to the event, deliberately walked his dog along the sign-posted track reserved for the racers. Clearly determined to cause trouble, he approached us and complained that a team of dogs had not only run him down but had also attacked his dog (which was showing no signs of distress or injury and in fact looked as if it was enjoying itself, unlike its owner). My instinct was to tell him to get off the track and get some counselling for his social problems. Before I could do so, Mary stepped in and placated the man with such charm and humour that by the time he left, he was thanking her for being so helpful. Once he was out of earshot, Mary turned to me and voiced her true opinion about his behaviour. I won't repeat what she actually said - but you can probably guess the gist of it. It was an honour to represent the committee and the School at Mary's funeral. The weather was very wet but that didn't stop over a hundred people attending to show their love and respect for Mary. I was talking to two of her carers after the service and when I mentioned knowing Mary for seven years, they both said they wished they had known her longer than they had and that she had kept her dignity and her sense of humour to the end. Mary Wibberley, what a lady! I, along with many others, will miss you but you were ready to 'conquer a new world'. Mary was my ‘first friend’ when I arrived at Swanwick in 1999. She was leading a talk about falling in love with your characters. The chairs were set in a large semi-circle and I sat down next to this lady, who very quickly told the group that she always fell in love with her leading men. “They have to be tall, dark and handsome and have very nice thighs” said Mary, then turned to me and read my name badge. “Martin, please stand up.” I did. She then began to feel my thighs, telling the group “Oh yes, he’s got lovely thighs.” I, of course being the shy and retiring type, went along with her and made funny faces to the group, muttering “Yes, yes. Don’t stop”. Later in the bar that evening, 7 ladies (complete strangers) felt my thighs and two more the next day. Mary and I hit it off from the start and when she came to Milton Keynes to give a talk to our Writers’ Group, she told the same story. But we’d arranged a twist. Mary said “Martin come here.” I did. She said “Drop your jeans.” As I was unbuckling my belt, our treasurer’s wife was heard to say (in a lovely posh voice) “My God, he’s going to do it”. I did ... but I was wearing a pair of cycling shorts under my trousers! Every year we would collect jokes to tell each other the following summer at Swanwick. With Mary, it was laughter all the way, but catch her in a quiet moment and she had a great depth of knowledge to draw from to help new writers like me. During my time as Print manager, I always wrote SWALK on the back of Mary’s Swanwick envelope – and that’s how I remember her, always ready with a joke, a laugh and a great helping hand to new writers. I look forward to February for as I turn over my Swanwick calendar there is such a lovely photo of the two of us sharing a “romantic moment”. Mary Wibberley, a great friend, a good laugh and she leaves a big hole in the Swanwicks to come. I was so sorry to hear the sad news about Mary. Swanwick will never be the same again, though I really believe there is a parallel Swanwick running with all the Swanwickers who have passed over, including my own mother. For me, though a non smoker, I always felt the smokers' tent ruled over by Mary, to be a safe retreat in times of insecurity and I will miss her very much. I didn't go near it last year. It wasn't the same. Like me, Mary was very sensitive to the suffering of animals and would save food from the dining table for the resident cat, but in recent years she couldn't even bear to hear mention of my rescue animals and would threaten to leave the table if anyone mentioned their pet dog, just in case they said something sad. I loved this side of Mary. The first course I attended at Swanwick back in 1988 was Mary's and it's the only one I remember now. She helped us to visualise our M&B hero coming up out of the sea and strolling towards us. Unfortunately I wasn't very bright and mine was wearing full diving gear. She did motivate me to have a go though, and I wrote a book as a result. Ah! I nearly forgot her famous ‘Dirty Mother’ cocktail nights. There'll be no more of those at Swanwick. Mary was a star and I will miss her. Mary was the reason I first attended Swanwick. My sons gave me her book ‘To Writers with Love’ as a birthday present, they being young, and, love being a word they used often in the context of birthday. And I being an unpublished aspiring author, it seemed a neat fit to them. When I discovered it was about writing romances I left it politely unread. Later, I heard Mary on radio being interviewed about the book and writing. She made so much sense that I read it straight through and booked my first Swanwick shortly thereafter on reading Mary's praise of the School, a place of which I had never before heard. I met her by chance on the first day at the Hayes, where she welcomed me as a white badge. When I told her I had travelled from Dublin on hearing her radio interview, she said the author picture on the book jacket was terrible and I should come and meet everyone, straight away, with an expansive wave of her arms. It was the start of a very funny and pleasant relationship with a beautiful woman and a brilliant writer and a very special friend. Entertainingly, Mary was of her time and still not of her time, somehow. As editor of the Swanwick newsletter I had to email Mary's copy to her daughter, Judith, to print out as Mary did not think much of email, preferring instead the pen in the hand. Having agreed that Mary would supply continuing items for the newsletter, she sent me handwritten material by post that I had to key in myself. By the following Swanwick I needed more material but Mary could not remember what she had sent me. This began another hilarious episode of both of us trying to recall that which we had shared and everybody else had read and neither of us could remember. When I ended my time as editor, Mary sent me a beautiful handwritten note that seemed to neatly bookend my Swanwick days. I am grieving today at the loss of my friend, Mary. May she drive Heaven itself mad with her stories and sudden enthusiasms, for I know she will soothe whatever troubled souls that care to fetch up beside her. She joins a growing school of stalwart Swanwickers who even now, I would say, are sitting around a celestial lawn welcoming white badges to their smiling ranks. I knew Mary as a teacher of romantic fiction writing, both at Swanwick and at the Scarborough Writers Weekend conferences. Mary inspired me so much that I later wrote and had published three romantic novels under a pseudonym - Janie Summers. These three romantic novels were published as eBooks in 2013. It is no small thing to be inspired by a teacher. It is rare, even, to find an inspiring teacher. Mary's unique combination of big personality, wicked humour, fun writing sessions, a zest for life (and romance!) totally wowed me. It is people like Mary who fling wide the doors to real creativity. She did so in ways still alive for me today; a blessing she's left to all who knew her as a teacher. Swanwick is often referred to as a ‘family’ and for over 40 years, Mary was unquestionably the head, heart and soul of our clan. 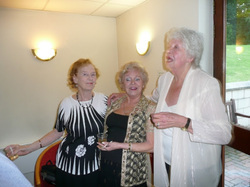 She had such a magical presence that for anyone who knew her, the Swanwick week only truly began once she had arrived. More than anyone I have ever known, Mary literally bestowed the gift of friendship. You had to earn it first and when you did, she made you feel special in countless different ways. I remember one time when she and I found ourselves alone for a chat, quite a rare occurrence at Swanwick with over 200 writers milling about. Our conversation turned to spiritual matters and, in particular, the celestial reality of angels. When another writer strolled over and asked if he could join us, she said kindly but firmly ‘Not just now, come back later’ and he ambled off again, not at all offended, simply because it was Mary who had asked. She had the most amazing effect on everyone. Mary also had a huge sense of fun. Someone asked her at one of the many inspirational talks she gave at Swanwick for advice on how to combine writing with the demands of raising a young family. Without a second’s hesitation, Mary said: ‘First you need a playpen. Make sure the children are safe and happily engaged with toys or books then climb into the playpen and start writing.’ Such was the awe in which she was held, the questioner duly wrote the advice down in her notes. Swanwick will never, ever be the same without the magic of Mary in our midst. But I have the strongest feeling that she will be there with us in love and spirit next August - and for all the Swanwick family gatherings thereafter. Author, teacher, animal lover, joker, believer, confidante and lover of life – Mary was all these things and more. She did untold good by stealth. Only her closest friends knew of her kindness and generosity to others. God bless you Mary, from your long time and loving friend. Mum was a complete one off. Obviously we were mightily embarrassed from time-to-time – when she once pulled the cords on all the musical toys in Boots, the multiple occasions when she would scrape the plates in a restaurant into a bag to take home for the foxes – but mostly we were immensely proud of her achievements. She was kind and generous of her time and compliments, had great insight, empathy and understanding. Her family, friends and animals were what mattered most to her and if she could also have a pen and paper and somewhere to have a cigarette and a coffee, she was happy. She was always very supportive of all that we did and was even more so of her three grandsons, Nicholas, Sam and Alex, encouraging and inspiring us all to be the best we could be and achieve all that was possible. She was also a loving aunt, cousin, sister and sister-in-law and we have had many letters and cards saying how much Mum had helped the sender to be more confident, pursue their writing or another project, how much she had supported them. That has been wonderful. Mum loved writing and words – especially the more obscure ones, ‘horripilation’ for example, and various collective nouns – and would always, in the nicest possible way, correct our grammar. We know when to use ‘fewer’ or ‘less’ for a start! 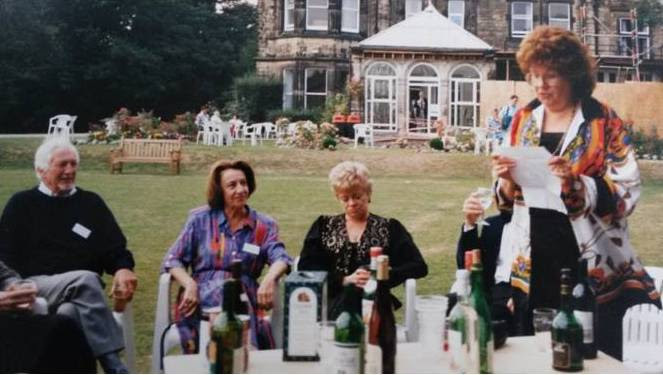 She also loved a quiz, was a great fan of The Big Bang Theory, lunches out with friends, family and her annual week at the Swanwick Writers’ School and anything to do with time travel, astronomy or angels. She played a mean hand of blackjack and poker and one of her favourite holidays was to Las Vegas. She also loved a good party and would always be the one regaling everyone with the rudest jokes and making friends in smokers’ corner. And she knew her limitations. Maths was never a strong point and she had terrible spatial awareness. Fortunately she never drove, although she had passed her driving test when in her early 20s. One of David’s most frightening moments came when taking her out for a refresher lesson after Dad’s death. Mum struggled with the hand, feet and eye co-ordination required and David called an end to the lesson when Mary started driving towards oncoming traffic. It was taxis after that. What Mum never was, was old, a cook (although she could do a mean omelette), a worrier, bothered about what other people thought about her or daunted by anything, least of all dying. Judith had a look in Mum’s huge book of quotes last week and the first one she read that Mary had marked was from Anais Nin: "People living deeply have no fear of death." Mary's funeral was held on Monday 30th December. You can view the Order of Service by clicking here. 'A Life in Pictures', a tribute prepared by Mary's daughter, can be viewed by clicking here.